The Flash: Fastest Man Alive! After issue #14, Barry will wish that tagline also applied to animals as he continues his battle against a Speed-Force-fueled Gorilla Grodd, while the simian shock troops of Gorilla City run rampant through his cityscape. 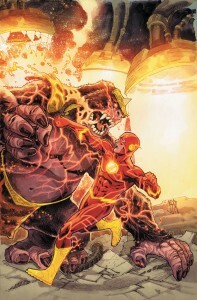 Steadily gaining momentum through the run, #14 finds itself at a frenetic peak of action; utilizing practically all of the characters and situations that Barry has encountered in the last 13+issues, even bringing new characters into the mix, to build into a chaotic frenzy as everything goes bananas! [Too on the nose? C’mon, the story’s title is ‘Gorilla Warfare’!] As Flash tries to learn the limits of his newly-minted rival, the Rogues of Central City find themselves in a power struggle for leadership as they temporarily set aside differences to protect their city from its Gorilla invaders. Meanwhile, the recently introduced brother of Iris, Daniel West, continues his search through the war-torn streets in his bid to find his lost sister amid the chaos. Across town, the invading forces of Grodd rush to get their technology setup, enslaving the human POW’s in a non-physical manner to do so. Dr. Elias, the mentor-turned-frenemy[?] who was the victim of an assassination attempt by the Rogues just before the invasion, clings to life as he is rushed to safety. While inside the Speed Force, Iris and her fellow survivors struggle to stay alive in an alien environment that has become increasingly unstable. As if that is not enough, Patty, Darryl, and Turbine fight their way INTO the city, desperately searching for a particular renegade to Grodd’s forces who Turbine is certain can help them from his decades within the Speed Force. Needless to say, there is a *lot* going on, and the pacing does a great job in spotlighting each subgroup against the backdrop of the titanic struggle between Barry and Grodd. 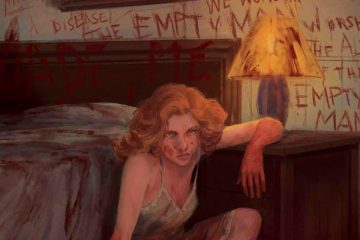 Something lost in the high-stakes tension is the humor that has been prevalent in previous issues, but it is infinitely made up for by the sheer amount of moving pieces in the story. While each vignette only moves its self-contained portion of the story ahead slightly, there is still an overall feeling of advancement as the issue draws to a close and things are turned on their ear again for Barry and his supporting cast. Adding to the mounds of praise heaped upon Manapul, the artwork is absolutely stunning; with a real sense of motion captured in each one of the sprawling layouts. The Flash is one of a select few titles that have kept me from going 100% digital, with its amazingly detailed layouts allowing my eye to soak in the page as a whole before delving into each nook and cranny of artistic goodness. The colors pop out from the page, bright and energetic even when depicting the grim images of a shattered city; and the art as a whole is able to bring a real gravitas to its characters when needed. Buy. While the series as a whole hit its high-water mark with the Annual, the tide has not ebbed much from that peak and appears to be ramping up for another sprint to the top.